Price: $25 Advance / $30 Door *Limited Seats! 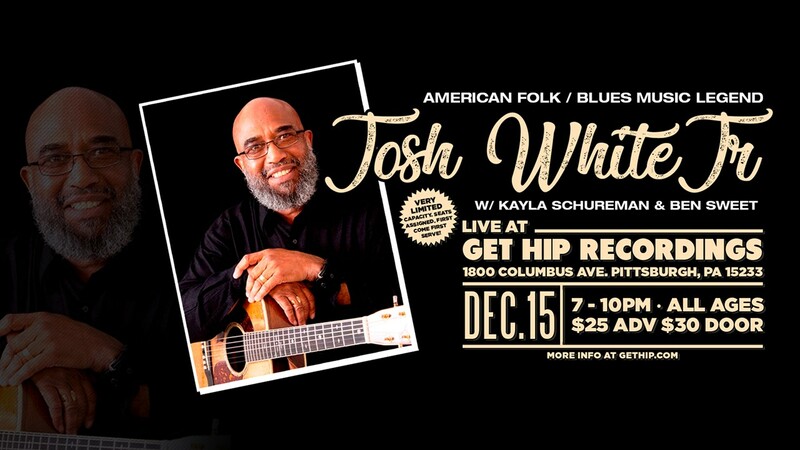 Legendary folk and blues artist Josh White Jr. has performed on some of the world’s greatest stages: Kennedy Center, Carnegie Hall, Lincoln Center, Odeon Hammersmith Hall, Berlin Philharmonic Hall, and Madison Square Garden. Next, he graces Get Hip Recordings along with alt/indie singer Kayla Schureman and singer/songwriter Benjamin Sweet. Serving drinks at the show are Pittsburgh Winery and Rock Bottom Brewery, and all attendees get a 10-percent discount on everything at the Get Hip Record store. Come for the music and leave with some music.